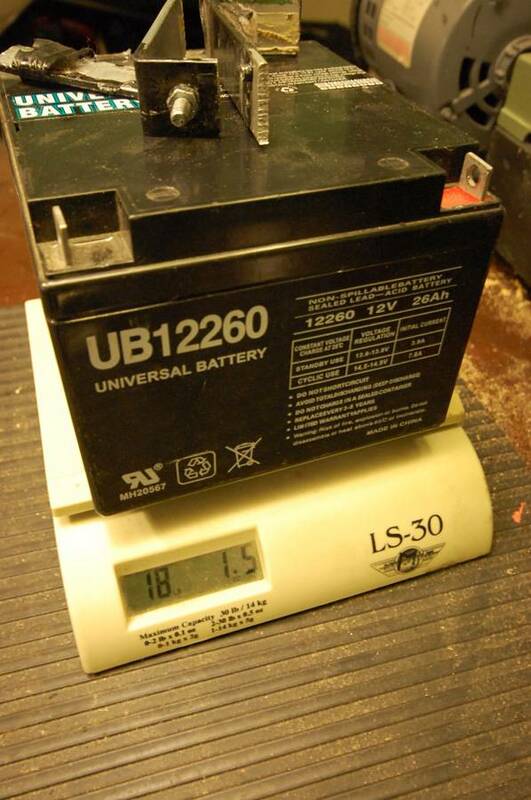 Almost a decade ago, I started a thread about improving on the weight of a standard battery by using a repurposed 18-lb wheelchair battery that could be had for as little as $30. 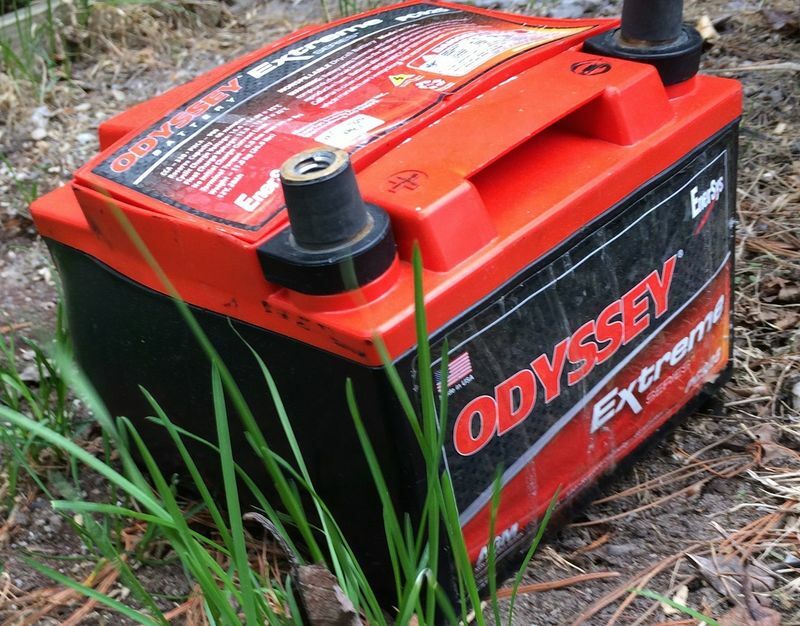 I called the thread the "Poor Man's Lightweight Battery" and it led to a lot of input for both poor and significantly-less-poor 911 owners looking to shed the anchor-like weight of old-technology batteries. 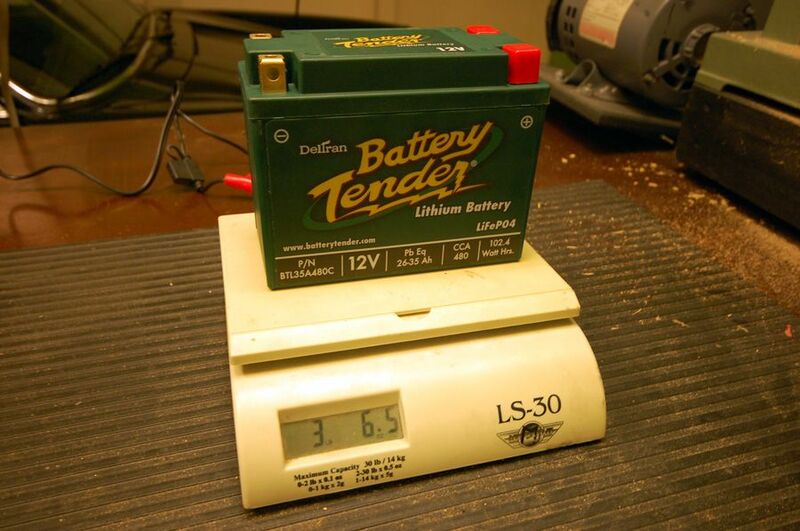 At the extreme end of the scale were things like the $2,950 Porsche Motorsports lithium battery which weighed 13 pounds. Steve Wong used his own technical expertise to repurpose lithium cells to make a 6-lb LiFEPO4 (Lithium Iron Phosphate) battery. Lots of racers use the 16-lb Odyssey PC680. I don't know if it's because of laptops or all the Priuses out there, but now you can get a Lithium Iron Phosphate battery from Battery Tender for under $200. It weighs less than 3-1/2 pounds. It doesn't fit into the 'Poor Man' category at that price. But it's not crazy-expensive either. And here's where the lucky part comes in, for me. My garage won a contest held by Classic Motorsports Magazine, and the prizes included $500 worth of stuff from Battery Tender. So I got one of their regular battery maintainers and also their LiFEPO4 battery and a maintainer designed for it. And as you can see here, it's about the size of the popular Odyssey battery. It's just that when you pick it up, it feels like they forgot to put the guts in it. I had to downsize the bracket I use in the smuggler's trunk. Repositioning the battery to this location really wouldn't be necessary if I'd started with a battery this light. And here's the old guy back on the scale, along with the portion of the tie-down I was able to chop out. My net weight savings was 14.7 pounds, and the cost to me (because of the contest, of course) was zero. That warms my thrifty heart. The Battery Tender LiFEPO4 battery can be got from Amazon for $185 and the LiFEPO4-specific charger/maintainer for it is $27. Here's a link, if you're interested. Now, that doesn't mean I'm not poor anymore. And it made me a little nuts to think about throwing out the old battery that still had a lot of life in it. But a little while back, we got a rainstorm here in California that delivered about an inch of rain per hour, and my driveway's drains backed up and I got about an inch of water in the pit I'd dug for my lift. 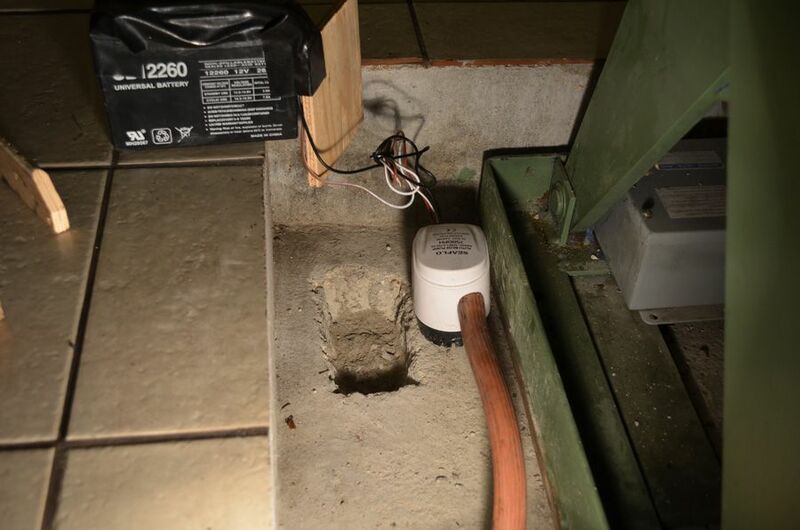 So I created a low spot in the concrete and added a little 12V bilge pump for a boat. It shoots the water out through the access hole for the lift pretty effectively, and it's powered by my old car battery. I'll probably attach the old trickle charger as well. Although the way it's set up now is mostly for testing. Waste not, want not, flood not. love to read these innovative fixes. Good info. Amazing the new battery technology. As usual Jack, you are ahead of the curve. Wow. That is light enough that when it comes time to toss the battery you should be able to toss it a respectable distance!! I wonder if they make something about 150% or 200% of the CCAs for a more conservative reserve. Looks like it might not fit into the rennline battery relocate kit, hmm. Last edited by Bergo; 04-21-2015 at 02:46 PM.. Nuts! This post came two weeks after I got a new Optima for my ST. My daily drivers needs a new battery too, so I guess I'll put the optima there and get one of these for the ST. I agree. It's surprising they haven't added a couple more cells, or whatever it is that makes the difference between their 300, 360 and 480 models (that all have the same form factor, but lower weights). I know some race car guys cut it close with 360CCA batteries. But a long, cold winter would make me nervous even with this 480CCA model. And you never know if the numbers are getting fudged with this shift in technology. The 26-35AH number is fuzzy. I think the battery is technically 10AH, based on some Googling I did, but the comparison to the older technology is not apples to apples at all. For what it's worth, I wasn't able to find anyone who'd had a bad experience with this battery. And Bergo, on the fitment issue, they provide adhesive-backed block pads to make up for the smaller size, which might work fine with the Rennline box. But then at 3.4 pounds, this is something that can be secured pretty easily. This morning I had the battery in one hand and a mug of coffee in the other, and the difference was pretty slight. Jack, are there any issues with how the alternator charges a LiPo? I ask because I use a lot of these batteries in RC stuff and charging them wrong ruins them. I've even seen them burst into flame when over charged - over charging is a possibility if an alternator fails. That's a good question. They do include a warning about a charger delivering more than 14.4 volts. But I think it's only about damaging the battery, not starting a fire. There are (at least) three different kinds of Lithium batteries. According to a quick Google search, these are the safest of the bunch. Cool, there's clearly a chemistry 'difference' between the LiPO's I'm referring to and the LiFePO. I'll certainly look into them for my race car build. Funny you're posting this now since I just installed my generic 12v battery from your old post this weekend. It works great and is definitely lighter than my OEM so still a great advantage. Well, I think the only warning with this one is that (according to what I've read), it can be problematic when the temperatures drop below freezing. So that's going to be an issue for people who drive in parts of the country where you're driving in the winter. And in 10 years, this technology will hopefully see its price drop even more. it doesn't have to even be freezing. if your car sits outside overnight in cold weather, starting capacity will be greatly diminished. they also don't do well with small electrical draws like an alarm. otherwise, they're very light, small and don't lose as much juice sitting unused as an agm. Thanks for keeping the lightweight battery quest alive! This might be the one for me. R Gruppe bicycles - Cannondale, Titus, Specialized, Bridgestone, Raleigh, Schwinn Paramount, and Scattante TT bike. Just adding a data point, the Deka/ East penn battery B ETX 30L has a cold amp rating of 400 weighs 21 pounds costs 75 bucks(second). Not a lightweight, but I've had this in the car since Nov.2009, and it is still running strong. A Light weight would be great but Deka is in Lion station PA which is my backyard so I'm supporting a local guys. I'm sure they have a light weight equivalent by now which I will check out when this one gives up the ghost. (2 sneaks and 2 airheads): BMWS: R12GS(a) R90S, and some old British iron as well. Lithium battery packs really need a balance port for a smart charger to keep each of the cells in a pack equally charged. The first time the pack gets unbalanced, easy such as when it gets accidentally drained dead, that's when a pack imbalance can cause serious problems, such as a fire and/or a significant reduction in pack capacity. For example, a 12 volt lithium cell such as for a car always consists of four 3.6 volt lithium cells wired in series to create a 14.4v battery pack, also known as a 4S configuration. Lithium battery chargers to bring the pack to full charge will charge the pack to 14.4 volts. If one of the cells gets out of balance and is lower, say at 50% of capacity than the other three, when the pack is being charged, when the other three reach 100% of capacity at 3.6v, this out of balance cell would only be at 3.2-3.3 volts. Since the sum total of the pack at this point would only be 3.6+3.6+3.6+3.2 = 14.0v, the charger will still continue to feed the pack until it sees 14.4. 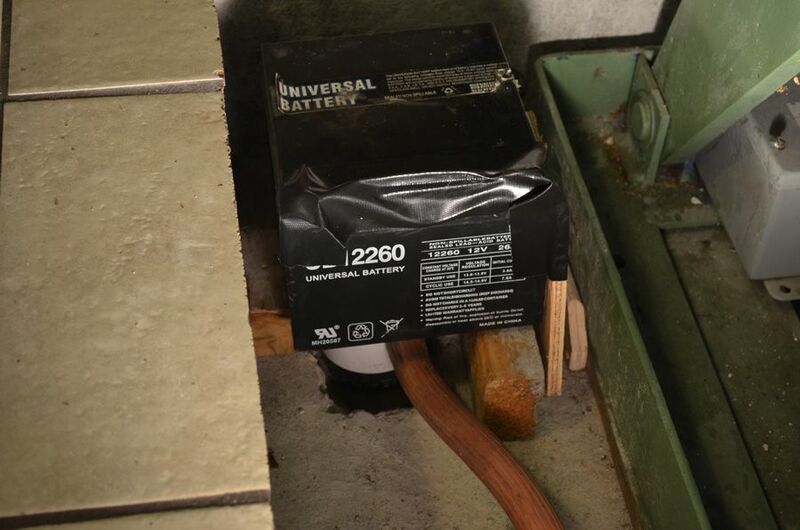 The result is the excess current overcharges the 3.6v packs, which on a typical lead acid battery, the excess current has no where to go except to boil the battery fluid and melt the lead plates. On a lithium cell, it has no where to go except to boil the electrolyte that is part of the lithium, thus overheating and a potential for fire. Also, regarding battery capacity, the capacity will only be as great as it's weakest cell. So once the weak cell above comes down almost to empty, the total pack voltage will be 3.3+3.3+3.3+0= 9.9v, so the car won't start. That 10Ah battery pack is essentially a 5Ah pack. So thus is why all RC hobbyists battery packs, laptop batteries, power tool batteries, cell phone batteries, electric/hybrid cars, etc have multiple connectors on them so each cell can be monitored by a smart charger circuit and the overcharging cells would be bled off until the lower capacity cell(s) catch up, keeping everything in balance and at full capacity. This way the battery can last 10, 15 or more years with no degradation. Otherwise, without, I've seen friends with lithium batteries go bad and unable to recover 6 months after they bought it. The better car lithium battery packs do have this balance port for a smart charger. 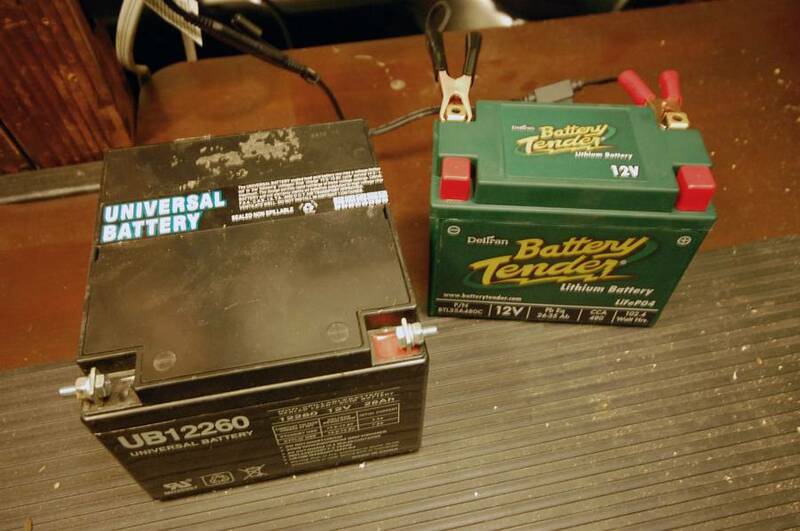 But if a pack such as this one by Battery Tender does not have one, it's not that difficult to add one but it does require opening the pack to attach and add the balancing port. Then you'd need a smart charger such as any of the ones that is used by RC hobbyists. Any update on how this battery is working after 6 weeks? I'm just about finished with my interior mods and will be moving onto the frunk next and replacing the heavy stock battery is on my to-do list. Thanks. So far, so good. Nothing to report other than that it works.